Outstanding reproduction. Looks very similar to an original folding canvas chair I have from 1944. Looks like a matched set. Always need a table when doing living history events for keeping personal items and having a place to keep things off the ground. It is just what I expected when I order something from WPG. This article was not in the parcel which you sent me by FedEx. This item was in top notch condition, all the leather and hinged parts were in perfect working order. Love this! I got one of these and I really like it. It isn''t a solid sturdy table like a field desk but is very good for light duty things like eating, hygiene, etc. 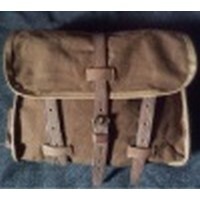 You have to love the British for some really great quality field equipment they developed during the War!! Very light easy to put into use! Thnks, WPG you guys are the best! !